The Northrop Grumman RQ-4 Global Hawk is a high-altitude long-endurance (HALE) Intelligence, Surveillance, and Reconnaissance (ISR) UAV/UAS. The Global hawk is powered by a single Rolls-Royce AE 3007H (military desig-nation is F137-RR-100) Turbofan engine with 8,600 pounds of thrust. Cruising at extremely high altitudes of up to 65,000 feet (19,800 meters), the RQ-4 can survey large geographic areas with pinpoint accuracy, providing real-time information about the location of the enemy as well as resources and personnel. When mission parameters are programmed into the Global Hawk, it can autonomously taxi, take off, fly, remain on station, return, and land. No actual remotely piloted flying takes place. Ground-based operators monitor the RQ-4's health and status, and can alter navigation and sensor plans during flight when necessary. The now retired RQ-4A was an imagery-intelligence (IMINT) UAS designed to carry a 2,000 pound payload. The RQ-4A has one configuration - the Block 10. The Block 10 employs an IMINT system comprised of a synthetic aperture radar (SAR) sensor and an EO / IR sensor. In 2011, the last of seven RQ-4As was retired from the Air Force inventory. The RQ-4B, the successor to the RQ-4A, is designed to carry 3,000 pounds of payload and enable multi-intelligence (multi-INT) collecting. The RQ-4B has three configurations: Block 20, Block 30, and Block 40. The Global Hawk ground segment includes the mission control element (MCE) and the launch and recovery element (LRE). The support segment includes aerospace ground equipment, tech orders, spares, support equipment, and training to enable operation of the Global Hawk UAS. The Global Hawk is operated by the 12th Reconnaissance Squadron at Beale Air Force Base (AFB) in California, and the 348th Reconnaissance Squadron at Grand Forks AFB in North Dakota, but aircraft are rotated to operational detachments worldwide. The Global Hawk flew for the first time at Edwards Air Force Base in California on February 28, 1998. The Global Hawk is equipped with a Hughes Integrated Surveillance & Reconnaissance (HISAR) sensor system. HISAR is a lower-cost derivative of Raytheon's ASARS-2 package, which Hughes Electronics (now part of Raytheon) developed for the Lockheed U-2 Dragon Lady spyplane. The Global Hawk is also equipped with the Raytheon AN/ALR-89 self-protection suite, which consists of the AN/ALR-90 pulsed Radar Warning Receiver (RWR), the AN/AVR-3 Laser Warning System, AN/APR-49 Radar Warning Receiver, a jamming system, and the AN/ALE-50 towed decoy. Major RQ-4 Global Hawk subcontractors are Aurora Flight Sciences (V-tail assembly and other composite structures), L-3 Communications (communication system), Raytheon Company (Hughes Integrated Surveillance & Reconnaissance (HISAR) system and ground station), Rolls-Royce (AE3007 turbofan engine), Héroux-Devtek (aircraft landing gear), and Triumph Group-Vought Aircraft (carbon fiber composite wing). The U.S. Air Force EQ-4B is a Global Hawk equipped with the Battlefield Airborne Communications Node (BACN), an airborne communications relay and gateway system that translates and distributes voice communications and other battlespace information from numerous sources. The system is also carried by the Bombardier E-11A. 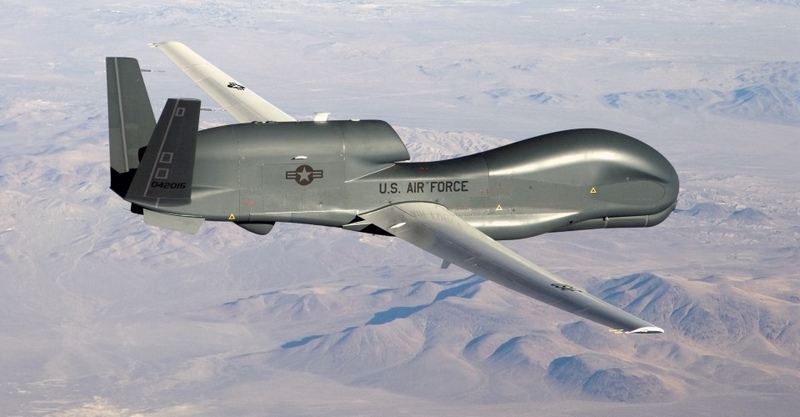 On June 4, 2015, the first Global Hawk-based RQ-4D Alliance Ground Surveillance NATO AGS aircraft was unveiled. The RQ-4D AGS is able to fly for up to 30 hours at a time and will provide NATO leaders with persistent global situational awareness. On 19 December, 2015, the RQ-4D made its first flight. All five aircraft will be based at Sigonella Air Base in Italy. The Northrop Grumman MQ-4C Triton is a maritime derivative of the RQ-4B Global Hawk and the airborne element of the U.S. Navy's Broad Area Maritime Surveillance Unmanned Aircraft System (BAMS UAS). The Triton will provide persistent maritime intelligence, surveillance, and reconnaissance (ISR) and has a mission radius of 2,000 nm (3,700 km). The MQ-4C flies at a maximum altitude 56,500 feet (17 km) and can stay aloft for up to 24 hrs. Other missions to be performed by the MQ-4C are support strike, signals intelligence (SIGINT), and communications relay. The MQ-4C will replace the EP-3E ARIES II and take over the SIGINT mission, while the P-8A Poseidon replaces the P-3C Orion's ASW, ASuW, and ISR missions. In the ISR role, the MQ-4C will complement the P-8A. The Triton's pilots and operators will be based at NAS Jacksonville. The MQ-4C is equipped with multiple payloads for ISR, maritime SAR and inverse SAR. The aircraft is equipped with a Northrop Grumman Multi-Function Active Sensor Active Electronically Steered Array (MFAS AESA) radar with maritime and air-to-ground modes and long-range detection and classification of targets; an MTS-B electro optical/infrared (EO/IR) multi-spectral targeting system w/full motion video and high resolution imagery at multiple field-of-views and auto-target tracking; an automatic identification system (AIS) which provides information received from VHF broadcasts on maritime vessel movements; a basic communications relay capability; and the AN/ZLQ-1 Electronic Support Measures (ESM) package. The MQ-4C made its first flight on May 22, 2013. On November 10, 2017, Northrop Grumman delivered the first operational MQ-4C Triton aircraft to the U.S. Navy. On June 26, 2018, it was announced that Australia will purchase six MQ-4Cs to be delivered in the 2023-25 timeframe. 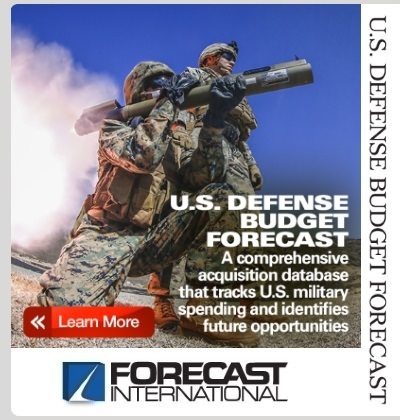 A 15-year MQ-4C production forecast is available through Forecast International's Platinum Forecast System, which includes a breakout of total market unit and value statistics by manufacturer and end-user. This real-time service also includes information on all prime and subcontractors, contract awards, worldwide inventories, a complete program history, and a rationale detailing the outlook of the program. A 10-year MQ-4C production forecast is also available in report format through Forecast International's UAV Forecast service. The Air Force RQ-4 performs high-altitude, near-real-time, high-resolution Intelligence, Surveillance, and Reconnaissance (ISR) collection while the Navy MQ-4C Triton provides persistent maritime ISR to combatant commanders from five orbits worldwide. 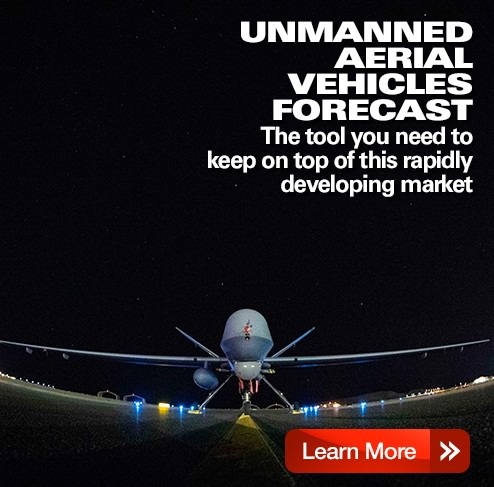 Complete and detailed information, including production forecast data, is provided in our Market Intelligence Service: Unmanned Vehicles Forecast - Airborne Systems.